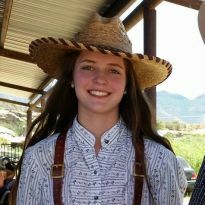 Paige Dasher aka Ivy Hills began Cowboy Action Shooting at the age of 11 with her twin sister Quinn and Uncle Van Bradley ( aka Hank Hills ) and Aunt Stacey Bradley ( aka Heather Hills ). Paige has many accomplishments under her gun belt. 2014 One of the six inaugural SASS junior competitors across the nation to be named Cimarron Firearms Young Gun and received a pair of Pietta Cimarron single action revolvers, slicked up and competition ready. 2015 Ladies Fastest Rifle, Western Divisional Championship in Norco California, putting 10 rounds on multiple targets in 3.3 seconds!